Click here for “Potting Media and Plant Propagation – Start Farming- Penn State Extension”. Excellent information including different recipes for seedling mixes for starting transplants. Make your own highly nutritious mixes to control the quality and potentially save money (key to healthy mixtures: finely screen/sift and pasteruize compost first, before adding amendments). Lightly water mix before placing in your 10×20 flats or inserts. Once the seeds are dropped in, sprinkle some dry mix over them to cover. Flats may be gently watered by using a FOGG-IT Brass Fine Nozzle (click here for information). Do not under or over water and be careful of damping off as some compost based mixes tend to hold water more than a soilless mix. Experiment with your optimal moisture content before propagating a large production, especially with keeping soil moist but not saturated. Place flats directly on Pro-Grow Heavy-Duty Professional Propagation Mats with Pro-Grow Heavy-Duty Control Thermostat (click here for information) or in a Pro-Grow Heavy-Duty Germination Chamber (click here) for controlled propagation. Fish emulsion with kelp added may be used as needed on transplants. For large growing operations, click here to see Pro-Grow’s line of Heavy-Duty Soil Mixers. 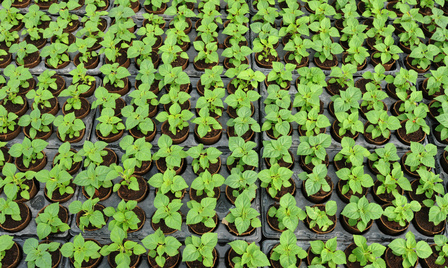 Click here: for “Seed and Seedling Biology” – from Penn State Extension. Posted on December 1, 2013 at 7:52 pm in Uncategorized	| RSS feed You can skip to the end and leave a reply.